"We have revived pride in our fatherland," Putin said during the ceremony held in the Kremlin. Two days ago, protests were held in 19 cities against "Tsar Putin" with thousands of arrests. Opposition leader Alexei Navalny was briefly detained. 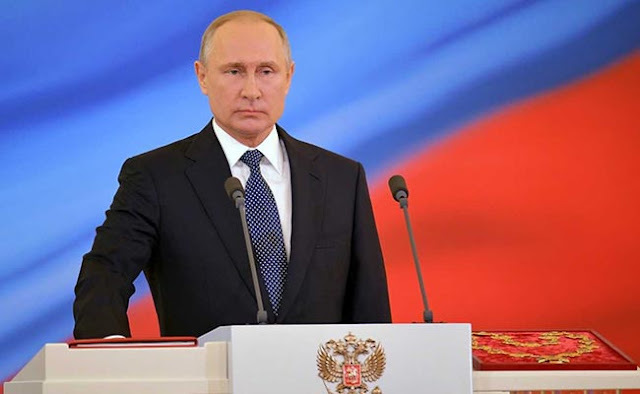 Moscow (AsiaNews/Agencies) – Against the background of the gilded walls and crystal chandeliers of the Kremlin’s Andreyevsky Hall, Vladimir Putin today swore on the Russian constitution, taking his fourth oath of office as president of Russia (picture 1, video). Right after the national anthem, he gave a short speech in which he promised to "multiply the strength and prosperity of Russia”. Noting that “We have revived pride in our fatherland," Mr Putin added that in the past Russia had risen again from setbacks, "like a phoenix". Vladimir Putin has been in power for 18 years, either as president or as prime minister, so much so as that his adversaries call him "Tsar Putin". Some feared possible demonstrations today to coincide with the president's oath of office, but so far, nothing has happened. Putin was re-elected president last March with more than 76 per cent of the votes.